For over 125 years, Byer of Maine has been a leader in camping, emergency preparedness and a long list of other outdoor products designed to make your time in the wilds comfortable and convenient. This passion for creating innovative products is highlighted in the new, award winning TriLite Line. Washing dishes, the dreaded chore that most of us try to avoid at all costs becomes even more difficult when attempted in the wilds. When camping, one attempts to awkwardly crouch by the lake or streamside frantically scraping beanie weenies off plates and hoping that in the process they do not get their feet wet. Leave it up to the innovative folks at Byer of Maine to come up with a solution that makes washing dishes in the wilds a much easier endeavor and one that can actually be enjoyed. The convertible TriLite seat/wash basin is a lightweight, highly portable piece of equipment that should be part of every camper’s kitchen. In seconds, one can remove the small seat from the webfoot stand and install the TriLite washbasin. Boasting 4 separate compartments, the washbasin has plenty of room to wash, rinse, and dry dishes, as well as a small pocket to hold biodegradable soap and a scrub brush. This set-up allows you to sit down comfortably and leisurely wash dishes, avoiding the typical discomforts associated with this chore. 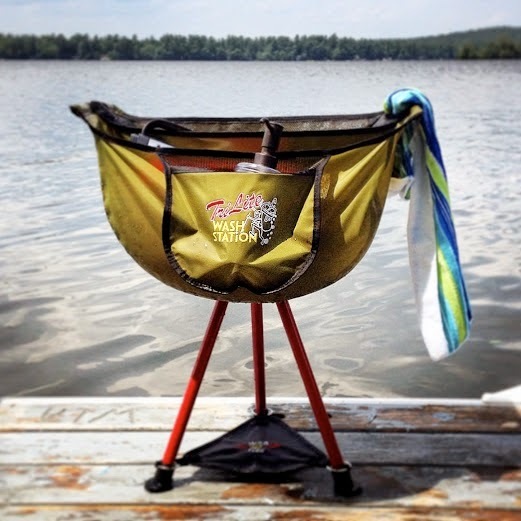 The Tri-lite stool and wash station is currently 35% off so go and get yours today and prepare to spend the rest of the Maine summer camping season impressing friends and washing dishes in style! Summer in Maine means camping and as I get older, comfort becomes more and more critical to my enjoyment of this outdoor activity. After years of struggling with half a dozen different models of inflatable rubber mattresses, I finally gave up patching holes and battling against the exhaustive effort of inflating and transporting these unreliable beds. For the camper looking for a much improved sleep solution they need to look no further then the cot. Cots of today come in a wide variety of styles. Byer of Maine has an impressive line of folding cots sure to fit the needs of every type of camper and outdoor enthusiast. From lightweight and compact to full size, luxurious models, all cots are built rugged, with some models capable of supporting up to 375 pounds! Byer even have created a handy cot comparison tool to assist shoppers in choosing the cot that best fits their specific needs and budgets! 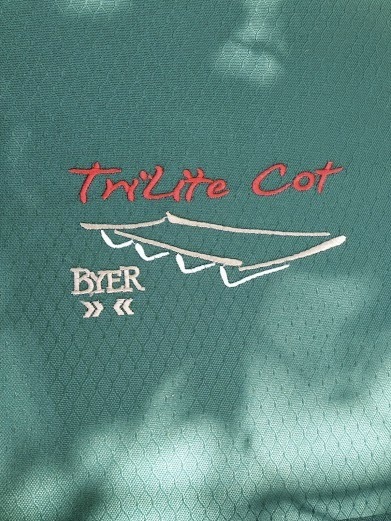 For me the choice of cot was as easy as ordering the lightweight and easily packable TriLite model. This ultra-light weight cot (a little over 7 lbs) is designed to be packed and brought anywhere, ensuring a great sleep wherever you need it. Perfect for hiking, car camping, motorcycle touring or even a day relaxing on the beach, the TriLite cot offers a full sleep surface of 74" long by 25" wide, that folds down to a mere 27" x 3" x 8" and fits into its rip-stop polyester travel bag that has a convenient travel strap so that the entire cot can be slung over your shoulder for easy transport.